Seneca Women is a global leadership platform centered on the principle that advancing women and girls will fast forward us to a more equitable and prosperous world. Seneca Point Global is a leading strategic advisory firm focused on advising companies and public sector institutions seeking to advance women and girls. Based on the book Fast Forward, the Seneca Connect app connects women to each other and to opportunities to fast-forward women and girls by showcasing women owned businesses, impactful nonprofits, curated events, research and news. Designed to advance women in the economy around the world, Seneca Connect provides a new tool that helps women use their power for purpose and weigh in on important and timely topics. under-examined. Support research led by a female clinician-scientist from the UCSF Memory and Aging Center focused on biomarkers for early detection of Alzheimer’s disease, with a special interest in understanding women’s increased risk and developing novel therapies. Bloomberg Equality Summit which Seneca partnered on with Bloomberg. 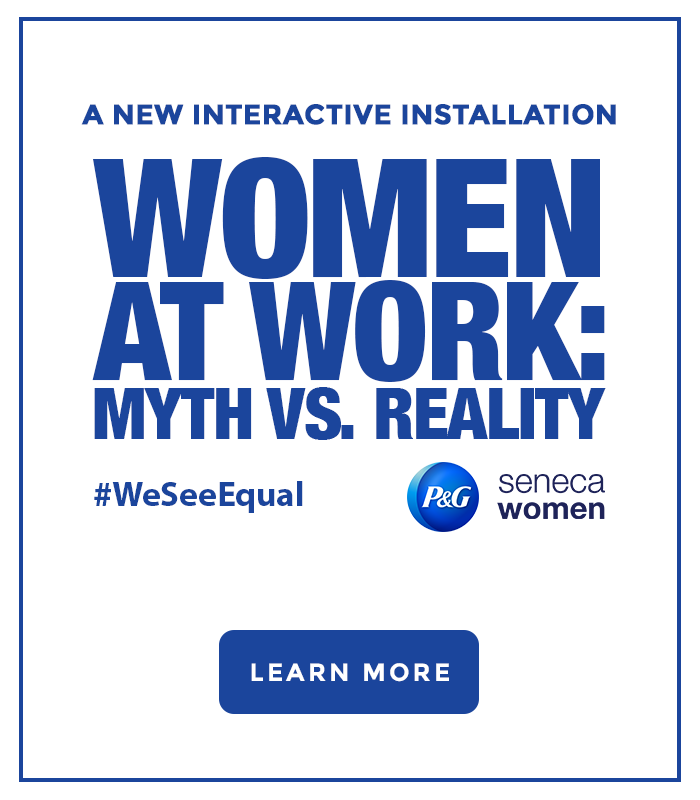 A special exhibit, co-hosted by Procter & Gamble and Seneca Women, identifies the new myths that are holding women back at work and provides insights and solutions that company leaders can use to create a gender-equal workplace. Featured at the Bloomberg Business of Equality Summit, The World Economic Forum and the New York Times New Rules Summit. To learn more about the exhibit, email [email protected]. Seneca Connect for enterprise fosters diversity & inclusion, leadership development, a purpose-driven workplace and employee & stakeholder engagement. Learn more here. To demo the app and for more information, email us at [email protected]. Fast Forward: How Women Can Achieve Power and Purpose shows how some of the world's most inspiring women are using their power for purpose and redefining what power and success mean in the process. individuals to create shared value, advancing women and girls while driving sustainable results. Our client work includes strategy, research and implementation. Young women want to know how to use their power for purpose. That’s why they’re forming Fast Forward Girls Clubs, where they can live the principles of Fast Forward and participate in activities that help advance women and girls.